DO make sure ground is well watered before planting. DO NOT allow roots to dry out at any stage of planting. DO NOT add fertiliser until roses begin to be established, ie spring. DO NOT use weedicides in ground preparation or near roses at any stage. 1. Upon arrival, unwrap plastic and place roots in plain water for at least 24 hours and leave there until planting your rose. DO NOT LET ROOTS DRY OUT!! 2. Plant out your roses as soon as possible after soaking. (See below for instructions). At least 6hrs of direct sun light over the day is required, preferably more. DO NOT replant into old soil where roses have been removed. Renew with fresh soil. They require a good draining soil with a ph of 6.5. For more information regarding the prepartion of soil, click here. 1. Dig a hole about 30cm wide by 25cm deep with a small mound at the bottom to place the roots in a downward position. 2. Water plant before covering roots with soil, firming down lightly creating a moat. 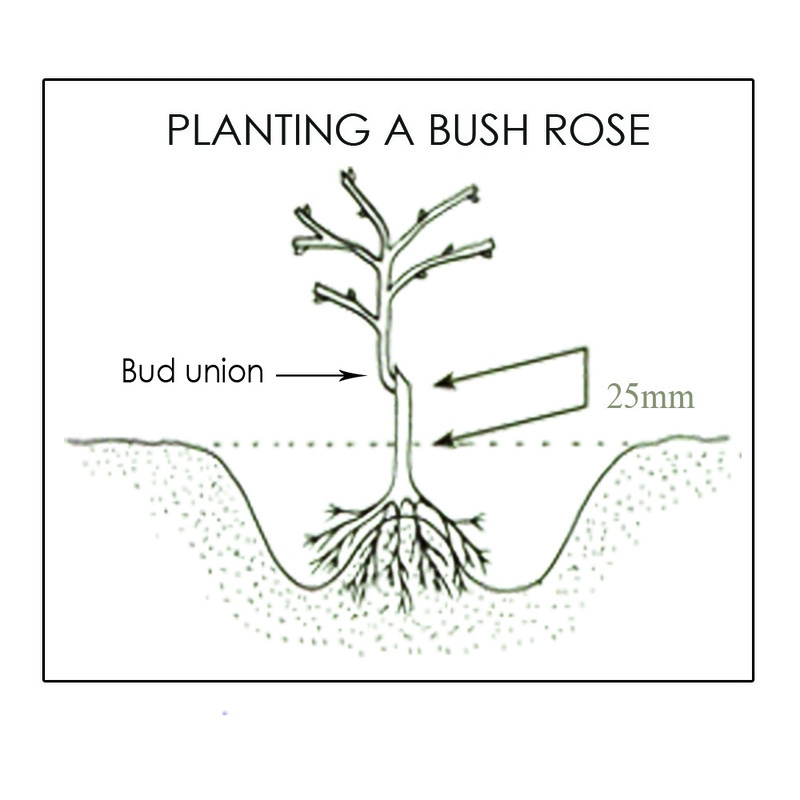 The graft or bud union should be 25mm above the soil level. 4. Standard Roses should always be securely tied to a sturdy stake (as per diagram). 5. Mulch your roses. This reduce the water requirment as the mulch will retain a lower soil temperature keeping the moisture in, while reduce the weed growth in your garden. A good mulch for roses is sugar cane mulch or pea straw. Click here for more details on mulching. 6. Prune the branches to approximately 25cm in length from the graft, just above a good growth-eye (excluding climbers). 1. Select an open space in the garden and dig a large hole. Place bundled roses into hole and cover the roots with soil. 2. Keep well watered until you are able to plant. Ensure your plants will still be planted out into thier spot during the winter dormant season. Planting out after winter may cause plant failure. 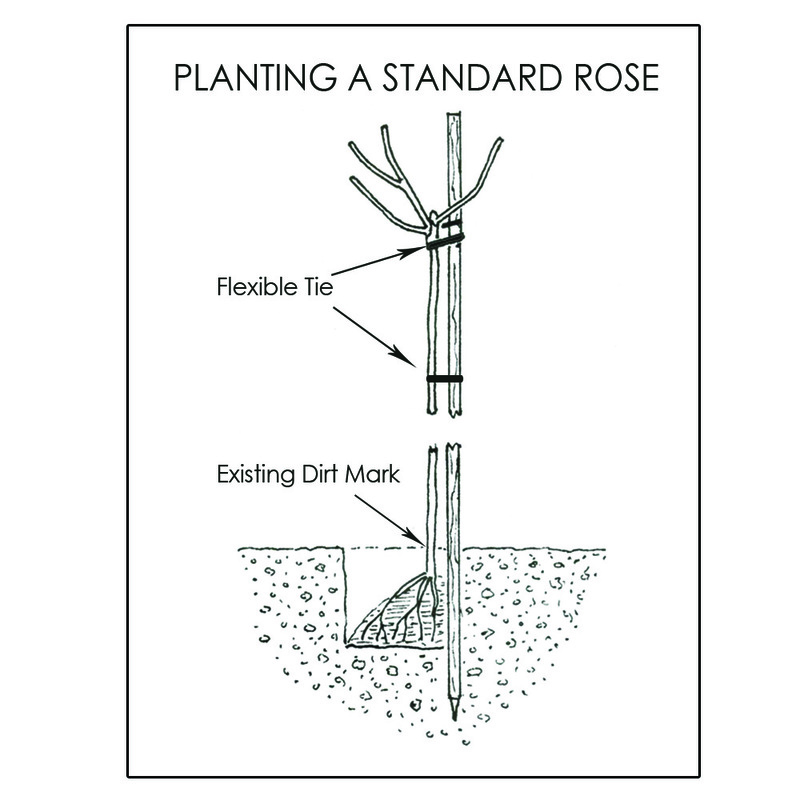 One of the most common reasons that bare root roses do not shoot is due the roots drying out. Make sure that throughout the planting process and for the first year after planting, your roses are receiving sufficient water - that is 10 to 20 litres twice a week. Click here for more details on watering roses. Please do not hesitate to contact us for if you have any queries.